Orion Fans, a division of Knight Electronics, has been around since 1979. 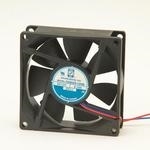 They design, develop, and manufacture a wide selection of AC, and DC fans, fan trays, and fan accessories. Hutch & Son is happy to carry a selection of these great products. Fan; Filter Kit; Retainer and Guard UL94V-0; Media PU Foam 30ppi; 80mm Cord; 24 in. ; Straight; 2; C180; UL Listed, CSA Certified; Blunt Cut Handy screwdriver with shaft and 4 different tips. Fan; 3.15 in. L x 3.15 in. W; 0.984 in. ; 24 VDC; 32 CFM (Max. ); 27 dB; Ball Hospital grade power cord 18AWG SJT 8' 5-15P 10 amp Fan, DC; Radial; 12 VDC; 0.29 A; 33 dB; Ball; 50 CFM; Wire Leaded; 0.24 in.